I’m a fan of productivity. It is not a coincidence that I’m the maintainer of Calendar and To Do. And even though I’m not a power user, I’m a heavy user of productivity applications. For some time now, I’m finding the overall experience of GNOME To Do clumsy and far from ideal. Recently, I received a thank you email from a fellow user, and I asked they what they think that could be improved. It was not a surprise when they said To Do’s interface is clumsy too. That motivated me to experiment and bother our designers about ways to improve GNOME To Do. With the great help of Tobias Bernard, a super awsome contributor, we could figure out a way to improve the current situation. 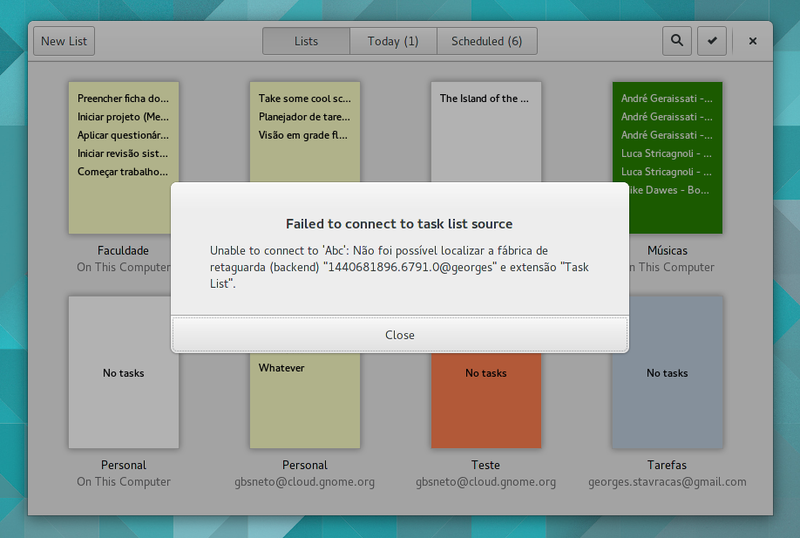 One of the problems of GNOME To Do was the translucent task rows. Priorities would be semi-transparent colors applied on top of transparent rows. Can you tell which tasks are high, medium and low priority tasks? All opaque rows with priorities at the borders. I personally think this is a small, but huge improvement over the previous state. When you have to stare at tasklists for hours, the minor annoyances are what causes the biggest frustrations. Another big aspect of To Do that was the task editor panel. This was initially made based on some old mockups, but this proved to not be the ideal experience. So Tobias suggested me inline editing of tasks. I went ahead and implemented it, and the result looked actually very good! Editing the task where the task is represented. Any comments? Thoughts? Please let me know in the comments! And don’t ever forget, you can always get involved – you just need to get in touch, and join us at #gnome-todo at irc.gnome.org. Thanks for letting me know, To Do! And you can use it just like a regular tasklist! A few new features were showcased in this blog post, but to me, the topmost important change is the stability of GNOME To Do. I’ve been using it regularly for the past couple of weeks and it’s pretty stable, but I know that bugs are there, just waiting for someone to trigger them. If you see To Do crashing or behaving oddly, please file a bug at the gnome-todo product in GNOME Bugzilla. And make sure to join #gnome-todo room at GNOME IRC and say hi. 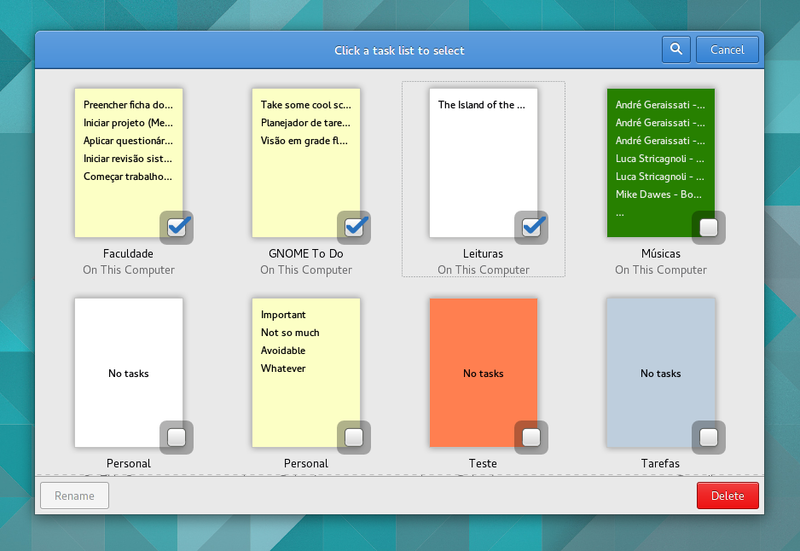 With your help, we can make GNOME To Do the best personal task manager out there! It’s been a while, folks. Some of you might have noticed that GNOME To Do wasn’t released with GNOME 3.22. There is a reason for that: I didn’t have enough time to add new features, or fix any bugs. But that changed, and in fact big things happened. You guys know that GNOME To Do has built-in support for plugins, and is highly extensible. You can add new panels, hook up your amazing new feature in various ways, and add new data sources, all without touching the core of the application. For this release, I ported the ‘Today’ and the ‘Scheduled’ panels to be plugins. That means that you can customize most of your experience withing GNOME To Do now – we ship various plugins and a default experience, and the user selects what fits him/her the best. Many plugins are available now – and the list will grow. I, for one, don’t use the ‘Scheduled’ panel that much, so I simply wiped it out of my way. It feels very fresh to customize it to perfectly fit my workflow. But that’s all that happened! Pretty much a requirement to me, subtasks are very important to my workflow. I usually have a big task (usually a project) with many subtasks. That required a huge work to make it happen in GNOME To Do, but the result is quite nice. You can drag a row over another one, and tada!, you just made the dragged row subtask of the hovered row. 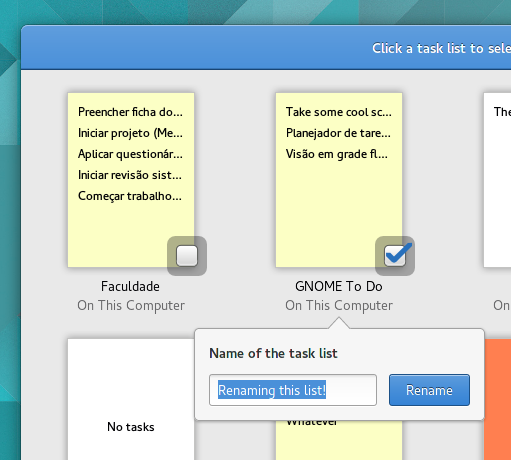 One more step into making GNOME To Do my default task list app. Dark theme was basically non-functional on GNOME To Do. Because it heavily relies on custom theming, many CSS code it used to ship only worked well on light themes. Since I don’t override my dark theme override setting, and because no one ever provided a patch, this was never fixed until now. And to demonstrate how the plugin system is powerful, I added a tiny plugin that switches between dark and light variants, hoping that it can be used as an example plugin for newcomers. The new Dark Theme plugin in action. I will release GNOME To Do 3.22 after some more testing – I’m pretty sure there are very specific corner cases that I didn’t managed to reproduce, and someone will fall into it. Overall, I think this is a nice feature set to land, and I’m quite happy with the current state of GNOME To Do. Of course it can use some improvements, but I’ll focus my development on new plugins, new data sources (Todoist someone? Remember the milk? Here we go!) and exotic features like statistics about your productivity, RPG-like task management, etc. Excited? 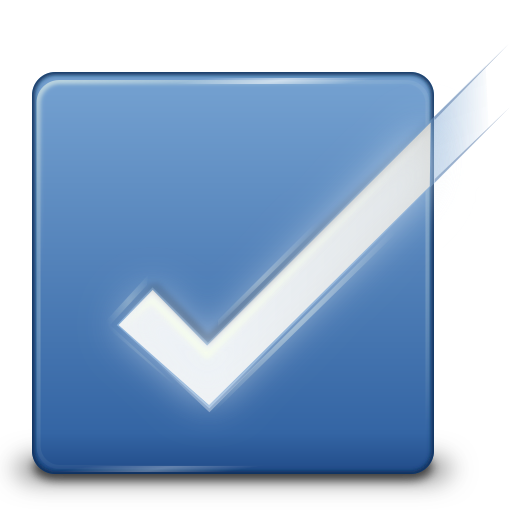 Join us in creating the best tasklist management application ever. New contributors are always welcomed. Join #gnome-todo room at the GNOME IRC server, test the application, file bugs – every single contribution matters. I’m starting a small series of posts describing a general how-to on writing plugins for GNOME To Do. The good news: GNOME To Do has a very small API and it’s very easy to build plugins. Note: I’ll show examples in Python 3, since this might lower the barrier for contributors and it’s a language that I know (and LibPeas supports). If you don’t know what LibPeas is, click here. Before jumping into code, let’s talk about the internals. GNOME To Do allows developers to extend it in 3 ways: adding UI elements, adding new panels and implementing new data sources. Every plugin has a single entry point: GtdActivatable. Plugins must provide an implementation of this interface. I’ll write more about this interface below. activate: called after the plugin is loaded and everything is set up. deactivate: called after the plugins is unloaded and all the registered data sources and UI elements are removed. get_header_widgets: retrieves a list of widgets, usually buttons, to be added to the headerbar. This can be the hook point for your functionality, for example. get_preferences_panel: if your plugin needs further configuration, you can pass the preferences panel through this method. get_panels: retrieve the list of panels of the plugin. A dedicated blog post will be written about it in the near future. get_providers: retrieves the list of data sources your plugin may provide. GtdProvider is the interface a data source should implement. A dedicated blog post will be written about it in the nearby future. The next posts will be about the various ways to add functionalities to GNOME To Do. Also, the next posts will demonstrate plugins through examples of various kinds. Stay tuned! Aye folks! Since a few weeks ago, GNOME To Do saw quite a big number of changes. As some of you may not be strict git followers, a good review of the latest changes may come in handy. Let’s go! I’m expecting some input on it, as I strongly believe this is not the ideal UI for the list view. For example, it’d be nice to display the number of tasks each list have. Anyway, a small new feature was added as well – task headers. Not perfect yet, but at least working. Hope this will be useful! Now, the single most important thing that this release has to offer. Ladies and gentlemen, please say hello to the new plugin system. 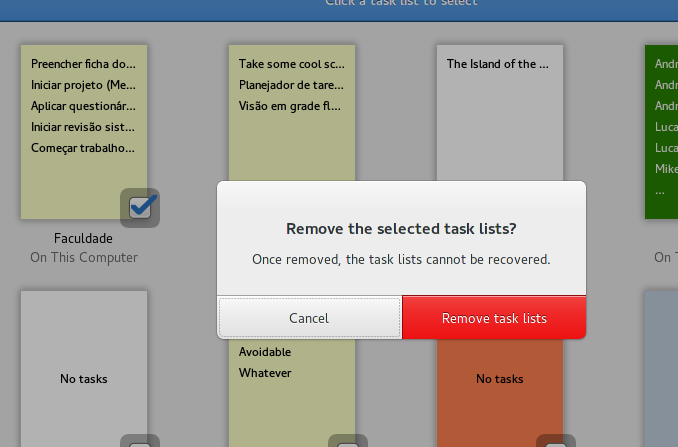 There are many things we can do with a personal task manager. We can have integration with different sources of tasks like Google Tasks, Remember the Milk, Todoist, among others. We can also have new features like user statistics, Bugzilla integration, different handling of recurrency, et cetera. Imagination is the limit. Since I’m pretty sure I’m not enough to implement all the crazy ideas, I decided to make To Do handle plugins, so third-party developers can make their own extensions. This work is obviously inspired in the awsome work made by Christian Hergert with GNOME Builder. Ops! Look, you’re not seeing that I’m working on Todoist integration, ok? I want to take this paragraph just to say a big thank you for Patrick Griffis – he gave an unvaluable help on post-fixups on the plugin system. Please, dudes, applause for him! The plugin system itself is built on top of Libpeas, which happen to have a really mature API. I took a special care to reimplement the plugin manager window to better fit GNOME HIG, with the hope it’ll serve as an inpiration for the libpeas-gtk widgets to be updated. And yeah, you’re not being tricked by your eyes. I am working on Todoist integration – you can check it here. Next posts will explain the new To Do API with an example, fictional plugin. Stay tuned! We did it. Yes, we finally made it. We’re having the 3.18 release, and is the best release ever – just like every GNOME release. We saw many cool features landing, a number of awsome project which the GNOME interns (hey, I was one of them too!) worked on this summer and lots of exciting news going around. Every new GNOME release, however, actually just an excuse for the next one. There’s always room for improvements and the work never ends. I personally like the beginning of new release cycles so that I can plan ahead what I’ll probably work on. And why not share it? Calendar theme will get some attention. Minor details will be fixed. Every single struggle pointed by Gina’s usability tests is going to be fixed. We’ll finally have Drag n’ Drop support! Hopefully, Week view will be ready. Much like To Do, Calendar will receive some error reporting UI too. A new flow grid view will land (see Google Keep’s grid view to have an idea). Support for subtasks (and the many cool things we can do with that). Full GOA support (actually depends on Evolution-Data-Server work). Improve the way we do bookmarking on Nautilus (possibly will reflect on Gtk+ too). Remove the duplicated GtkPlacesView code. Show the free space of local disks, as shown in the mockups. Cleanup & document the code. Expose it as a public widget (and also remove the duplicated code from Nautilus). I’m also hoping to work on smaller things with Music and Maps. And last week, I made my first patches for Grilo! Stay tuned for updates on that. There’s not much to say besides that. I sincerely hope you guys enjoy using the new GNOME 3.18 release, just as much as I enjoyed working on it! See ya! Two months ago, GNOME To Do was introduced to the outside world. People got (unexpectedly, I must admit) excited about it, and said that the app looks promising. A month lated, another version was release with a bunch of new features. Now that we’re reaching the 3.18 release, it’s time to settle things down and stop the heavy development phase (which, by the way, should have stopped 3 weeks ago!). Let’s see what changed. The biggest highlight of this development cycle is the new selection mode. 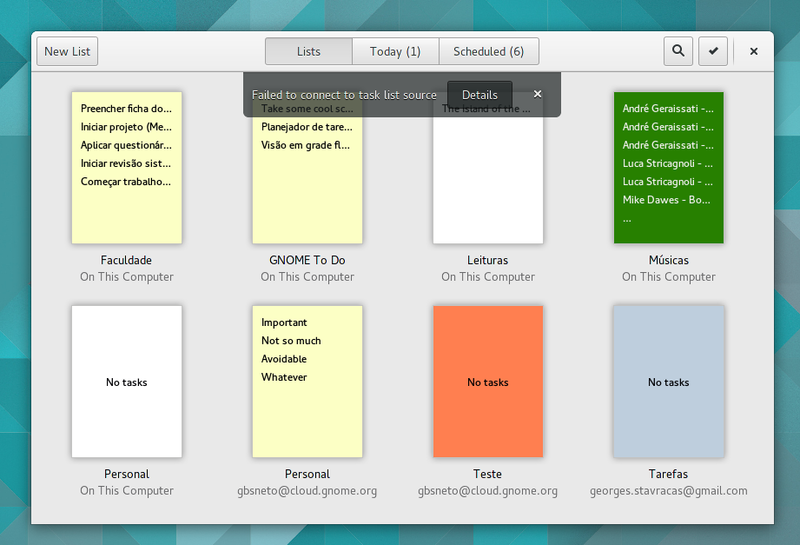 Following the GNOME selection pattern, it enables deleting & renaming tasks. Some tasks are undeletable (something I couldn’t resolve reliably in time) and the Delete button gets insensitive for them. Something that almost missed this release, To Do is now able to report errors that may happen. Error reporting, while it may sound too technical, is very important for the users to be able to share their issues without a major burden. Many fixed and cleanups were introduced. A whole class of annoyances was fixed, making GNOME To Do very pleasant and smooth to use. I sincerely hope that this small and simple application will help you organize yourselves and, at the very end, optimize your life and make you guys happier & healthier! Update: don’t forget to check the brand new GNOME To Do page!